Pacific Coast Hybrids are a necessity for a woodland or meadow garden. PCHs are very easy to grow in filtered or full sun along the coast and in partial to full shade inland. Their slender, dark green 12”-18” leaves look like clumped grass. 3”-4” flowers occur from late February to April on stems that elevate the diversely colored flowers above the leaves. These iris prefer well drained, slightly acidic soil but are tolerant of many soil types if oak leaves, pine needles or peat moss is added to to improve the acid condition of the soil. They can take water twice a month and will eventually form clumps up to 3 feet across. Clumps maybe divided in late winter. PCHs are fabulous in rock gardens, in meadow and woodland plantings and for growing without summer irrigation under oaks. Try them in mass plantings with Island Alum Root (Heuchera maxima) for a stunning effect. 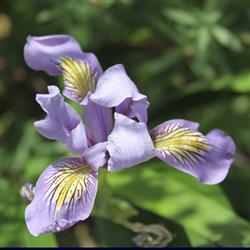 Hybrids began with crosses of Iris douglasiana and Iris inominata and were introduced by Skylark Nursery in 1975.